Parents / Guardians are requested to ensure that their children reach the school on time and are fetched in time after the last bell. The school shall look after the children for a maximum period of 15 minutes before and after the school. The pupils must reach the school 10 minutes before the first bell. Late arrivals will be sent back home at the parent’s risk. The responsibility of escorting children to and from the school rests with parents / Guardians. The school will not be responsible if the children stay out the school during its working hours. The school shall try to ensure the safety of children within the school premises only. Students are strictly forbidden to go out of school during school hours, without obtaining permission from the Principal. 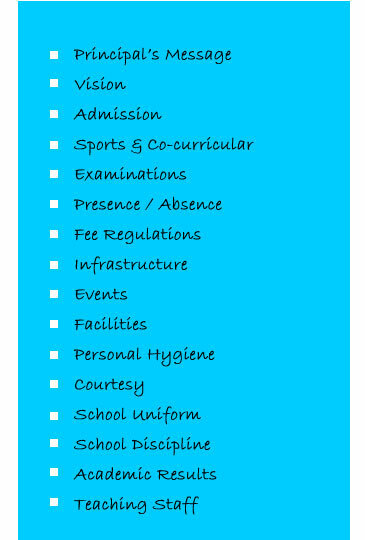 Irregular attendance, habitual lack of interest in work, words or action opposed to good conduct, cheating, stealing, misconduct even outside the school premises or any other practice liable to affect the good name of the school, are sufficient reasons for the dismissal of the child from school. Exchange of articles or money transaction between pupils is not allowed. Visitors are not allowed to enter the classrooms during school hours. They are requested to contact the school authorities. Students should maintain discipline in the classroom. Observe silence, during the time of prayer and when lessons are being explained by the teachers. No child is permitted to leave the class during class hours. No child is permitted to enter the staff room. Books, stationary bags, tiffin boxes, tie, belt should bear the name and class of the student. The school will not be responsible for lost articles, but the authorities will make an effort to trace the lost article, if the loss is reported promptly. No book other than school books should be brought to the school without the sanction of the teacher. All books and notebooks carry marks. Children must keep them neat and clean properly covered with brown paper. Students must bring the text books and note books according to their timetables. Parents / Guardian are earnestly requested to send their wards in neat and clean uniform and well polished shoes. They are requested to meet the teachers on the days fixed by the school authorities regarding their children’s progress in studies. A remark from the Principal and the teachers are made in the school dairy. Parents are requested to keep a check on them and sign as a proof of having noted them. Parents are requested not to give costly things like gold ornaments, wrist watch, money etc. to their child. The school authorities do not accept the responsibility for the loss of such things. Parents must also encourage the children to speak in English. Attention of parents is drawn to the fact without their help and cooperation not much success can be expected from the efforts made by the school. Parents please note that your child must get readmission within 15 days after the declaration of final results. Otherwise your child will not get admission in the next class.